Each year in the United States an estimated half a million pets are affected by fires. More than 40,000 of our family pets die from smoke inhalation alone. Once firefighters secure the family from danger, what happens to your four-legged family members? The First Responders priorities in an emergency are PEOPLE, PETS, and PROPERTY in that order! Animal Controls, Fire and Police departments that have received the FIDO® Bags and the training now feel confident they have the tools to give our pets the best chance of survival in these emergencies. The Superstition Fire & Medical District (formerly known as The Apache Junction Fire District) and the Apache Junction Police Department, were the recipients of nine FIDO Bags, all donated by residents and organizations from Gold Canyon and Apache Junction. The FIDO Project was Chair and Co-Chair by Gold Canyon residents Maxine Brown and Marta Saint-James. 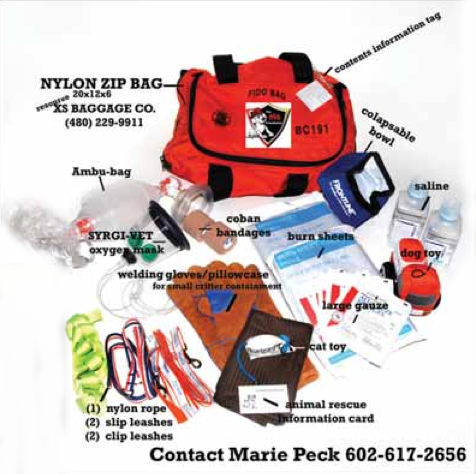 The bags were presented at the February 18th Apache Junction City Council meeting. The Association for the Development of a Better Environment (A.D.O.B.E.) donated a large FIDO Bag; the name of our organization is embroidered in the bag. These life-saving-kits can help dogs, cats, and horses. All six trucks for our Fire District, are now equipped with these life-saving-kits. The other three bags will serve the Apache Junction Paws & Claws Animal Care and Control. The Fetch Foundation www.thefetchfoundation.com is the creators of the FIDO Bags.